GEN. SANTOS CITY – Boxing fans will get to witness one of the biggest fight cards held in this region featuring three WBO regional title fights at the Oval Plaza Gym this Saturday. Jake Bornea (10-1,5KO’s) is set for the first defense of his WBO Asia-Pacific Youth flyweight title against Renerio Arizala(13-3-1,5KO’s). Bornea (left in top photo) easily made the division limit of 112 lbs while Arizala had to shed more than two pounds to make 112 on his second try during the official weigh-in held Friday at the Family Country Hotel and Convention Center in Gen. Santos City. Bornea did not assure victory during the press conference held before the weigh-in but vowed to give fans a really good fight. Arizala for his part was thankful for the opportunity to fight for a title. He said that with a win, the fans in the Philippines will get to know his name. Bornea is ranked number 13 among the contender’s list of the World Boxing Organization (WBO). He won the title by stopping Richard Rosales in four rounds last July. Arizala has a win against Romnick Magos and losses against Toshiyuki Igarashi in Japan and Genesis Libranza in his last three bouts. “Vicious” Vic Saludar (11-2,9KO’s) will defend his WBO Asia-Pacific minimumweight title against Lito Dante (11--5-3,6KO’s). Saludar was ahead on the judges’ scores after decking Japanese Kosei Tanaka in the fifth round last December 31 in their WBO minimumweight world title bout before succumbing to a body shot in the sixth round. Dante lost to Siyabonga Siyo in South Africa by unanimous verdict in a WBA International title bout last year but bounced back with back to back wins against Lester Abutan and Junuel Lacar. 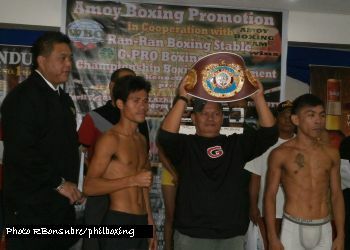 Dante is also ranked number one in the Philippines among the miniflyweights by boxrec.com. Dante said that he can beat Saludar and experience is on his side. Saludar for his part wants to go back to the win column and show the fans here what he can do inside the ring. Both boxers easily made 105 lbs. Two foreign boxers will battle for the vacant WBO Asia-Pacific featherweight crown – Hiroshige Osawa (29-3,18KO’s) of Japan and Yon Armed (12-5,6KO’s) of Indonesia. Ozawa made 125.5 lbs on the scales while Armed was half a pound lighter. 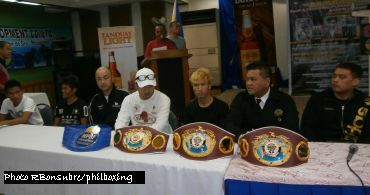 During the press conference, Promoter Alex Amoy assured the sportswriters in attendance of fair and unbiased officiating. Raymart Lumacad (113) vs Ramil Antaran(108) - 6 rounds. The bout between Froilan Saludar vs Nicardo Calamba has been cancelled. “KAMBAL KAMAO” is co-promoted by Amoy Boxing Promotions in cooperation with Ran-ran Boxing Stable, G-Pro Boxing Team and Championship Boxing Development of Kenneth Rontal. 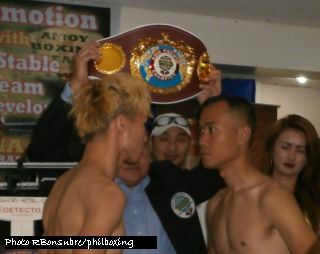 The weigh-in for the WBO bouts was supervised by WBO VP for Asia-Pacific Leon Panoncillo. The April 2 bouts here in Gensan will start at 2PM.